The episode focuses on Cindy as she tries to keep her mouth shut, with the help of a lawyer sent by her rabbi. We already know that Suzanne has been moved from Ad Seg but we just don’t know where she was sent to. This makes Cindy nervous; she spends some time trying to at least let Taystee know what happened to CO Piscatella. Since her fingerprints were found on the murder weapon, along with several others, she finds herself at a crossroads. We already know about Cindy’s daughter, Monica (Comic Sans), but in a whole new backstory we find Cindy struggling with loyalty, love, and trust for the good of herself and Monica. Cut to: Caputo and his new life of couch potatoing and animal crackers which is honestly not surprising. He reconnects with Healy, who we haven’t seen since his season four breakdown. Healy is a new man on a spiritual path, trying to encourage Caputo to just be happy and not to be too invested in Litchfield. While working on cleaning up his life, Caputo finds himself in a sticky situation when Figueroa exclaims that she will be taking over his job. The investigation continues with Gloria, relentless in blaming the whole riot on Maria. Gloria isn’t just trying to save herself but she’s also telling the truth: we can’t forget that the first half of the riot was lead by Maria and her determination to get revenge on the system that wronged her. Sure, Gloria may have over-exaggerated on the details, but Maria did not get out of the riot limelight until Caputo told her that the extension of her sentence was never processed. Pennsatucky finds herself on a road trip with CO Coates and CO Dixon, and believes that they are embarking on a freeing and life changing road trip. Pennsatucky grows increasingly unhappy and irritated with being trapped in the trunk — as one would. The road trip comes to a halt when Pennsatucky reveals herself to Dixon. Since the addition of the Litchfield “Cookies” Ad Seg has become overcrowded. Piper gets a new bunkmate, Beth (Finnerty Steeves), a seemingly friendly and harmless inmate contrasting with Piper’s full aggressive prison persona. Every season we want to believe that prison doesn’t change Piper because she spends so much time trying to prove that she’s better than everyone else when in fact she can be that same as others and in some cases even worse. Piper starts to open up to Beth, until it is revealed that Beth murdered her three children — the definition of don’t judge a book by its cover. Following the testimony of Gloria, Maria comes in with the F.B.I already on her tail but tries to push that the riot was all Gloria’s idea. While Maria testifies, Gloria enlists Blanca to also blame Maria for the entire riot. Blanca agrees to throw Maria under the bus, getting Gloria out of Ad Seg but it sadly doesn’t free Blanca. 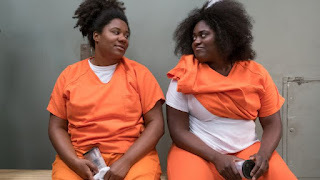 The F.B.I has much more on Blanca from the testimonies given by the other COs.
As the episode comes to an end, both Gloria and Daya are moved into C and D block; this sets off Blanca, but we then find out that Daya took a plea deal for killing a correctional officer. With their release follows Cindy, and it’s a bit unclear if she gives up Taystee. We see her emotionally struggle with what’s best for Monica and for herself. These inmates have basically spent more time with their prison families compared to their outside ones but real loyalties are soon to be tested. How far would you go to save yourself? Will our family stick together or fall apart? Keep out of trouble and keep tuning in!